This guide trains a neural network model to classify images of clothing, like sneakers and shirts. It's okay if you don't understand all the details, this is a fast-paced overview of a complete TensorFlow program with the details explained as we go. This guide uses tf.keras, a high-level API to build and train models in TensorFlow. Figure 1. Fashion-MNIST samples (by Zalando, MIT License). Fashion MNIST is intended as a drop-in replacement for the classic MNIST dataset—often used as the "Hello, World" of machine learning programs for computer vision. The MNIST dataset contains images of handwritten digits (0, 1, 2, etc) in an identical format to the articles of clothing we'll use here. This guide uses Fashion MNIST for variety, and because it's a slightly more challenging problem than regular MNIST. Both datasets are relatively small and are used to verify that an algorithm works as expected. They're good starting points to test and debug code. The train_images and train_labels arrays are the training set—the data the model uses to learn. The model is tested against the test set, the test_images, and test_labels arrays. Display the first 25 images from the training set and display the class name below each image. Verify that the data is in the correct format and we're ready to build and train the network. Building the neural network requires configuring the layers of the model, then compiling the model. The basic building block of a neural network is the layer. Layers extract representations from the data fed into them. And, hopefully, these representations are more meaningful for the problem at hand. Most of deep learning consists of chaining together simple layers. Most layers, like tf.keras.layers.Dense, have parameters that are learned during training. The first layer in this network, tf.keras.layers.Flatten, transforms the format of the images from a 2d-array (of 28 by 28 pixels), to a 1d-array of 28 * 28 = 784 pixels. Think of this layer as unstacking rows of pixels in the image and lining them up. This layer has no parameters to learn; it only reformats the data. 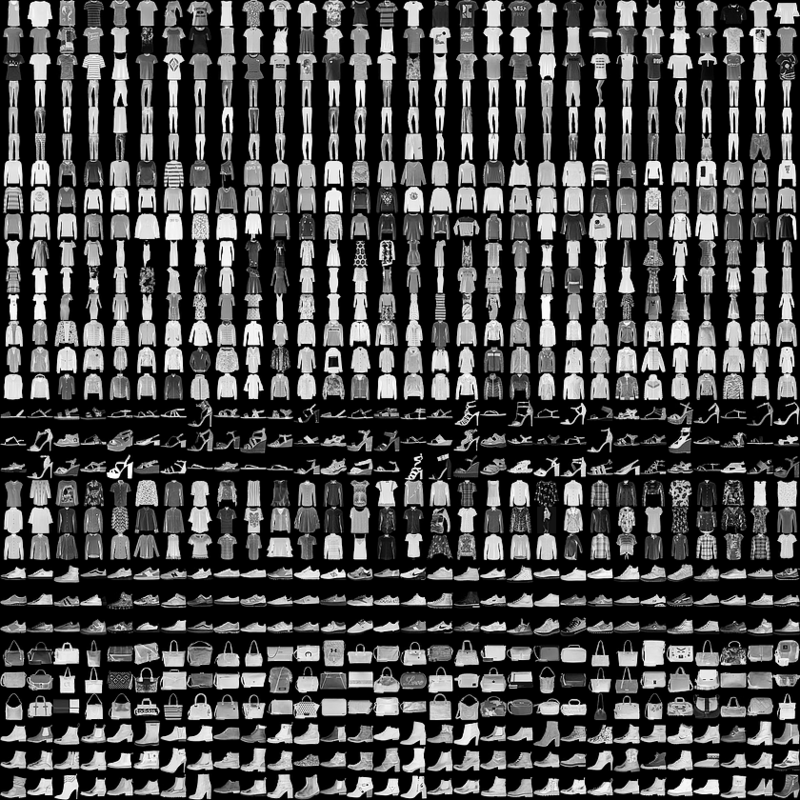 After the pixels are flattened, the network consists of a sequence of two tf.keras.layers.Dense layers. These are densely-connected, or fully-connected, neural layers. The first Dense layer has 128 nodes (or neurons). The second (and last) layer is a 10-node softmax layer—this returns an array of 10 probability scores that sum to 1. Each node contains a score that indicates the probability that the current image belongs to one of the 10 classes. Loss function —This measures how accurate the model is during training. We want to minimize this function to "steer" the model in the right direction. Optimizer —This is how the model is updated based on the data it sees and its loss function. Metrics —Used to monitor the training and testing steps. The following example uses accuracy, the fraction of the images that are correctly classified. Feed the training data to the model—in this example, the train_images and train_labels arrays. The model learns to associate images and labels. We ask the model to make predictions about a test set—in this example, the test_images array. We verify that the predictions match the labels from the test_labels array. As the model trains, the loss and accuracy metrics are displayed. This model reaches an accuracy of about 0.88 (or 88%) on the training data. It turns out, the accuracy on the test dataset is a little less than the accuracy on the training dataset. This gap between training accuracy and test accuracy is an example of overfitting. Overfitting is when a machine learning model performs worse on new data than on their training data. With the model trained, we can use it to make predictions about some images. Let's look at the 0th image, predictions, and prediction array. Let's plot several images with their predictions. Correct prediction labels are blue and incorrect prediction labels are red. The number gives the percent (out of 100) for the predicted label. Note that it can be wrong even when very confident. Finally, use the trained model to make a prediction about a single image. # Add the image to a batch where it's the only member. And, as before, the model predicts a label of 9.